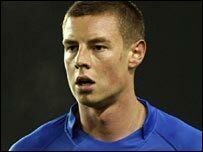 24 | February | 2008 | Through the seasons before us..
Have we loaned another crock? Having offloaded the football league’s most notorious warmer of treatment tables in Scott Dobie, it appears that we’re in danger of losing our latest loan acquisition – Will Hoskins – to the back injury he’s be struggling with lately. Of course, this injury was caused by actually playing, rather than tripping over his shoelaces, but all the same it’s very disappointing – particularly given Tyson too being injured. There’s a chance he may return to Watford for treatment, or not – we have to wait and see on that front, however it leaves Smoulds with some work to do in sourcing a replacement, in my opinion. We haven’t had a great deal of joy out of the loan system under Smoulderwood – I think the only other player he’s loaned in was James Henry from Reading, who lasted all of two minutes on the pitch as a late sub before being sent back again! Hopefully the injury to Hoskins is less serious than seems to be feared – he looked useful in the short spells we’ve seen of him, and add a bit of match fitness and sharpness to those performances and he would be a real asset to the side. If it is more serious then I seriously hope Forest will mobilise themselves quickly to secure a decent replacement loan signing… hope being the operative word here, because we don’t have a good track record of dealing quickly in the transfer market. Away day hoodoo dispelled with a win at Orient.. It didn’t need to be pretty, but boy did we need three points today – and we got them thanks to, I was going to say a daisy-cutter, but frankly, even an average daisy would’ve stopped Agogo’s shot, so let’s call it a pea-roller that somehow squirmed into the goal to give the vital victory to the Reds in a game that, whilst they dominated, struggled to convert half-chances into decent attempts on goal. Junior tested the Orient keeper within the first minute with a shot from 20 yards, but it wasn’t enough to cause any great trouble to him. After the game had settled down a bit on the ten minute mark, the 12-year-old Demetriou had Orient’s first effort of the game, similarly straight at the ‘keeper leaving Smithy with an easy stop to make. Wilson picked up an injury which looked serious, and saw us playing with 10 men for a spell with Sammy slotting in at the back to cover – fortunately he was able to return to action and so Forest reverted to the back three system, although today it did look more like a 3-5-2 rather than 5-3-2 formation thanks to the endeavours of Chambers and Bennett pushing forward down the wings. Despite having possession, Forest were struggling to create chances – Commons shot from the edge of the box but it was an easy save, and then a series of dangerous deliveries into the box just seemed to evade any of the black-shirted Forest players, which is a shame as Orient’s defending on crosses was absolutely shambolic, alas, so was our attacking of them, it seemed! Further chances before half time fell to Cohen, who shot wide, and from Agogo who drew another save from Nelson. Much like at the City Ground, Orient played into our hands by showing us far too much respect – Forest, for their part, worked hard at harrying and closing down the home side to limit their opportunities to get into the game. It wasn’t pretty, or convincing, from Forest – but it was a damn sight better than what we’ve seen lately away from the City Ground. The second half kicked off and Orient were much more positive – which worried me incase we’d expended our positivity and energy in the first half. Smithy dealt well with a cross coming in, and Wes characteristically threw himself infront of everything that came his way. Bennett broke forward despite being fouled, the referee waved advantage and he found Cohen who’s cross was well dealt with by Nelson. Our first chance proper came in the form of a freekick, Commons was felled on the edge of the box – and took the kick himself, curling a powerful shot over the wall and on target. Nelson saved well, but made a meal of it, and conceded the corner. From this point Forest really turned the screws on the home side, building up the pressure – Commons and Agogo combined well, but Holt could only direct his shot on the turn straight at the keeper. The goal came as a result of ‘one of those’ forward forays by Wes Morgan – with a series of bamboozling and clumsy stepovers, he managed to beat two players after which the ball broke for Agogo who hit an incredibly tame – but thankfully accurate shot – goalward, which somehow crept into the bottom right hand corner. The excellent travelling fans paused for a second, in disbelief it had gone in, before celebrating along with pretty much the whole Forest team. Pleasingly Forest continued to come forward, Chambers crossed excellently and it was good work from Nelson to get back to conceded a corner. After creating the goal, Wes almost gave Orient one back when a sliced clearance ended up hitting our own post – after a bit of kerfufflery in the penalty area that had our hearts in our mouths, the ball was cleared at the expense of a corner. Brecks – who had an excellent game (despite the idiot behind me slating him during the entire game despite it being evident he was having a good game!!) – picked up a daft booking after booting the ball into the stand after it had already crossed the line, a bit silly, although the referee didn’t see fit to punish the Orient player who kicked the ball away after the whisle earlier. Needless to say, it was – as ever – a shite ref. Brecks will now miss the Carlisle game. The increasingly tired looking Agogo was withdrawn for McGugan, with Commons pushing upfront with Holt, and Lewis slotting into midfield – probably a sensible move given the lack of comfort in the scoreline, rather than chucking Sinclair on. Although some characteristic ‘trying-to-be-too-clever-when-a-simple-pass-is-available’ goblin nearly struck him straight away – gifting possession to Orient who certainly finished the game stronger. Davies was introduced for Commons, and immediately got involved with some nice touches and skills – which is good to see. Given his lack of pitch time for us it’s difficult to make my mind up about him, but he looked lively, and teed up a half chance for McGugan which the youngster unfortunately spannered wide, there were also moments where he linked up with his old Yeovil teammate Cohen in promising fashion. Forest did still have the odd foray forward though, a cross from Chambers was met by Grant Holt, unfortunately the fact he was moving backwards to get it and the cross was floated meant he couldn’t get much purchase on it to get power – so it ended up a fairly soft header straight at the ‘keeper again. Perchy was introduced for Chambers (Perchy? At right back? Fookin’ hell! ), I was expecting him to replace Bennett who’d pulled up with cramp, but Jules soldiered on to the final whistle. As the whistle went there was much-longed-for celebrations amongst the players and fans alike, it was a bit cheesy but nice to see the squad and staff come over with arms linked to give a bow to the travelling Reds fans who’d been on pretty good form themselves over the course of the afternoon. With Carlisle beating Doncaster it puts us back into the automatic promotion spots, which has to be a good thing! On the way back to the tube I was listening to the home fans, who were quite rightly saying things like “I don’t think if we had 2 days of stoppage time we’d have scored” – it’s true that Orient didn’t really remotely threaten us, which could take some shine off a win, or – and this is how I see it – reflects really well on how we shut them out of the game. Of course there was fortune in the manner of our scoring, but we certainly deserved to win.